If you follow any of my social sites I have used the phrase "Show Support In 2013!" several times this year. WHY? As a developing entrepreneur, blogger, and vlogger my desire to improve is always thirsty! I water that desire by researching what other one's like myself are doing to make their adventures successful. 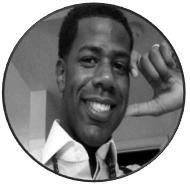 I will be adding a new part to my blog and it is an entrepreneur Spotlight section. Every month I will feature at least one small business entrepreneur, blogger, or vlogger that is making moves in the right way! I am always ready to support a small business because the world we live in is rough and anyone who has the courage to devote there time and energy to what they deserves to be SPOTLIGHTED! My very first spotlight is with the wonderful Kelvin Thompson of "Off The Kuff by Kelvin". Quick Bio: Kelvin is the founder, creator, and originator of "Off The Kuff" which specializes in Kustom Kufflinks Fit For Any Occasion! At the age of 28, Kelvin continues to show his eye for men's fashion in his unique hand crafted accessories. I had the honor to ask Kelvin a couple of questions to explore into his mind and find out more about how he got into the business world and what Off The Kuff really is. This is what I found out. You create cuff links and lapel pins, how long have you been doing this? I love the name "Off The Kuff"! How did you come up with that name? The name came from my uncle Darryl who I have always admired his particular style ever since I was a kid. My first pair of my cuff links I sent him a picture and he really loved them. He encouraged me to keep doing them and he gave me the name Off The Kuff and I just rolled with it! Now I'm going have to send him some royalties right? lol. "POWER DOWN"! What really is Off The Kuff and why did you create it? Oh that is any easy question! Let me sum it up. 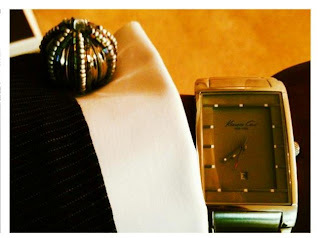 I created "Off The Kuff" for the everyday "Dapper Gentlemen" You might ask, "What considers one as 'dapper'?. It all comes down to this fellas: Ladies love DETAILS. Gents, lets give them what they want! Would you consider yourself an entrepreneur? If so, why? YES! I do consider myself an entrepreneur. I had an idea and I put forth action and executed it. Now I have turned my idea into something I make profit from. How did you build up an entrepreneur spirit? I really believe it is not something that I build up, but that I was born with. I have always like different things that consist of style and originality. Honestly, it is just natural for me to just....do me! lol! Is there anyone or any certain thing that motivates you? No, I like what I like, so I create based off what I like and what I think people will like. There are those who encourage me however. Why did you decide to go into the men's accessory industry and not another one? I chose this industry because it's something I already know about. I already know what looks good and I like to consider myself pretty fashion forward. So it was only logical to join this industry. I am sure you faced problems we all face when starting like no sales or things not moving well. How do you keep moving on in spite of all these hurdles? Since originally my goal was to make things that I like, I never really focused on sales. It was more of what would look good on me and what I would wear. When I would wear my handcrafted cuff links I would get asked where they could buy a pair when I informed them I made them myself. I just recently started selling online and in person. I do monitor my etsy shop daily to see how many views I get and what items people are looking out to determine what people are interested. I don't make sales my main focus. If no one is buying, I don't let it discourage me. All the products I create I can wear myself, so I don't feel like I am loosing money because I am creating what I like. If it happens to make money GREAT! and if not I am okay. In time it will happen. Is it easy to be an entrepreneur? No it is not easy. There is so much competition out there, you have to know what is in demand. Sometimes that can be challenging. You have to keep up with the changing fads and fashions and just what people want. It's not easy, but it's certainly not impossible. Are you the only one managing your business, or do you have staff? Currently, it is a one man show, but behind every great man is a great woman standing beside of him. My wife is great! I look to her for support, suggestions, and opinions. That's my better half so why wouldn't I!? If you can turn the hands of time, forwards or backwards, what would you do? I would love to own my own physical shop here in Atlanta, GA that would feature all my items. That would be really awesome! Since you have already went through the steps of developing your business, esty shop, and your brand, what advice would you like give those who are just starting or desire to start? My advice would be to start small, keep it simple and have an open mind to new things. Never limit yourself. The sky is the limit. Don't be afraid to take chances. Your items are great! 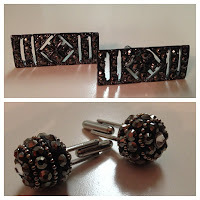 Where can my readers go to get a pair of your Kustom made Kuff Links and Lapel pins? Kelvin, is there any last words you want to leave my readers and are there any plans in the near future for Off The Kuff? I recently launched my spring line of kufflinks and lapel pins. Also be on the look out for my kustom handmade neck ties. I truly enjoyed learning more about the brand & business of Off The Kuff by Kelvin! What do you all think? I would love to hear from you. Feel free to leave a comment. If you would like to read about more men and women hustling the right way please be sure to join the site or subscribe via email for updates. minimum an hour or two.